Mail service status. You can switch the mail service on or off for a domain (Activate mail service on this domain). Important: Switching off the mail service on a domain is necessary if an external mail service (such as GMail) is used: Turning off the local mail service ensures correct mail delivery. Continue returning all such mail back to senders (Bounce with message option). Forward all such mail to the specified email address (Forward to address option). This is also referred to as a catch-all address. 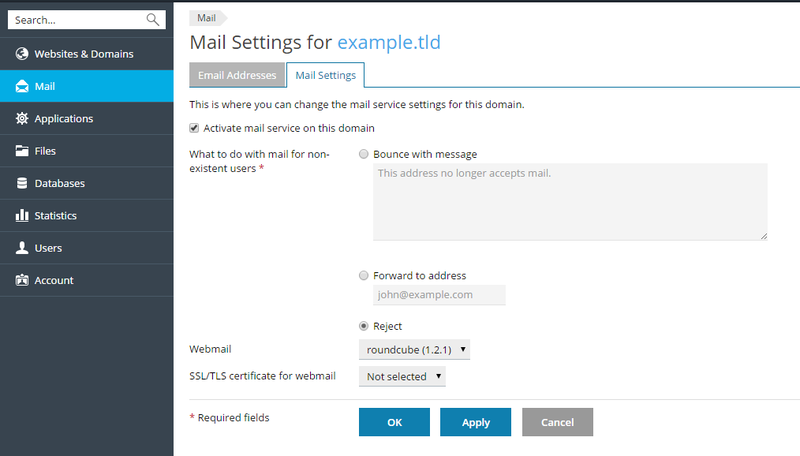 Note that if the outgoing mail control is turned on by your hosting provider, the forwarding address must belong to the same domain for which you are modifying mail bounce settings. If you need to specify an external email address (that is, outside the domain) or set one address for multiple domains, please contact your hosting provider. Forward all such mail to another mail server with the specified IP address using the option Redirect to external mail server with IP address (available only for Windows hosting). Reject such mail without accepting it. If the sender's SMTP client is behaving properly, it will generate a "Recipient address rejected: User unknown in virtual mailbox table" non-delivery notice (Reject option). Webmail. If your service plan provides the option to choose which webmail program to use for domains, then you can select it in the mail settings. Use DKIM spam protection system to sign outgoing email messages. DKIM "provides a method for validating a domain name identity that is associated with a message through cryptographic authentication" (www.dkim.org). default._domainkey.example.com - contains the public part of the generated key. _ domainkey.example.com - contains the DKIM policy. In addition to DKIM, Plesk supports SPF and DMARC policies for outgoing mail. Both are based on the rules specified in the sender DNS zone. DMARC policy defines how the receiver should treat email messages depending on the results of DKIM and SPF checking. In Plesk, a DMARC-related DNS record contains the general policy that recommends that messages are not deleted even if they failed checking. You can specify stricter policy. However, note that the receiver is free to apply its own policy to incoming mail. You can change the SPF and DMARK policies for your domain in the domain's DNS settings (learn about this later in this section). Note: Some capabilities, such as DKIM, webmail, or mailing lists, might be unavailable depending on your hosting plan and Plesk's server-wide settings. Go to Websites & Domains and find the domain for which you want to change mail settings. Click Mail Settings in the domain's settings. Edit settings and click OK.
Go to Mail > the Mail Settings tab. Select several domains in the list of domains, by clicking the corresponding checkboxes. Click the corresponding buttons on the toolbar (Activate/Deactivate Services, Webmail, Mail for Non-Existent Users, or Limit Outgoing Messages) and edit the settings. All the selected domains will have the same mail service settings.